So I spent a lot of time driving back and forth from the hardware store today, I had planned to get a "lot of stuff done" in the yard, and I did, but I also spent a lot of time being stupid. My day started with a "quick" trip, which took longer, and resulted in a very large piece of lumber sticking out the back of the car. I only had wanted to do that one more time... but managed to buy the wrong thing... A 2"x8"x12' instead of a 2"x6"x12, yes I know 2 inches whats the big deal (other then I'm speaking in imperial instead of metric.) The issue is that I need two equally sized pieces of lumber to act as the joist for my shelf, and I already had one 2x6 left from the first phase. 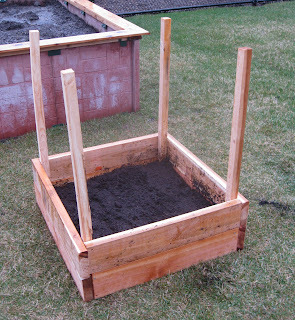 I did get the lumber for my potato box, but more on that later. So back we go to the store, with a honey-do list of this's and thats to get. I manage to return the wood, get a new piece, a weed whacker, a gas can, some screws, some clamps, a new tape measure, some brain damage, some brain damaged staff, a pricing issue, an ulsar, some rain, and some *sounds of exhausted exasperation*. So we toddled about, and had a hard time finding everything. 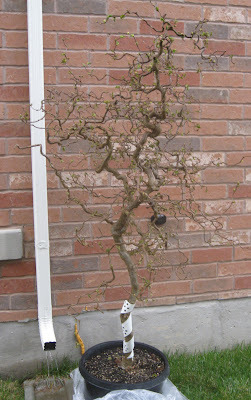 Then we found a tree we really wanted (need to figure out about where best to plant it.) 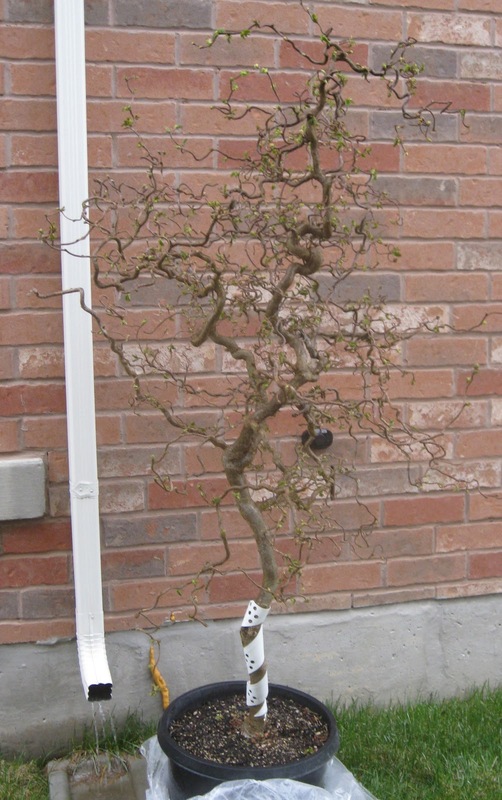 It is a corkscrew hazel standard, first picture time. We've always loved the one in Erin's parents yard, (which sadly died suddenly.) This one was a standard, and already pretty corkscrewy. The hard part, was that all other ornamental standards, except it were 30% off, and so I started a chain reaction by asking if it was miss labeled, it took an age and a day to discover it wasn't on sale, but because it was by criteria in the sale of the week category they would give us the sale price. At this point, we wanted it, and the shenanigan to find out the price had gone on long enough that we felt obliged to get it. It also meant that B was getting fussy and so was E.
Then we bumped into Huma, which was fun, and B had a great time showing her all the water features. At some point it all fell apart and fun turned to toddler mania. We bailed with tree and got home, the dieters (aka Erin and I) were starved and grumpy. We fed B, got him to nap, Erin drugged Evie with milk, us fed, we tackled the gardening. So we got our raspberries in the grounds, and added some lilly of the valley for extra smell. So we have two invasive indigenous species who can duke it out. Next up I got my potato box started, I have to blame/thank brad for this, I hope to swap potato stories with him this year. I had so many extra Yukon Gold's left I gave them to my neighbours, we agreed between the potatoes, apples, tomatoes, and misc berries we are going to start a little garden fresh store at the end of the driveway. 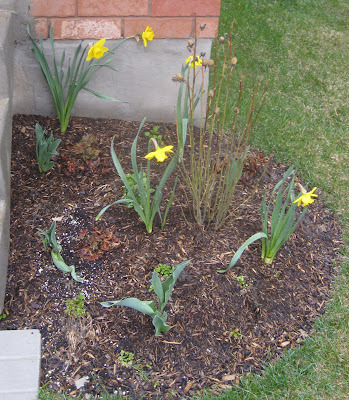 The rest of the garden is starting to come back to life, first, of course, is the daffodils. They are blooming, and the tulips and day lilies are starting to sprout. 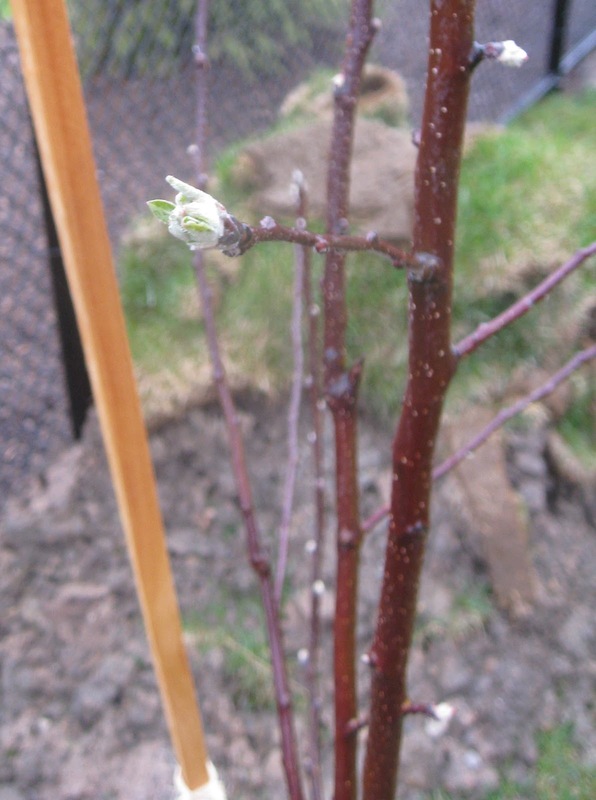 My apple's are also starting to bud, and their leaves are ever so tiny where they are out. 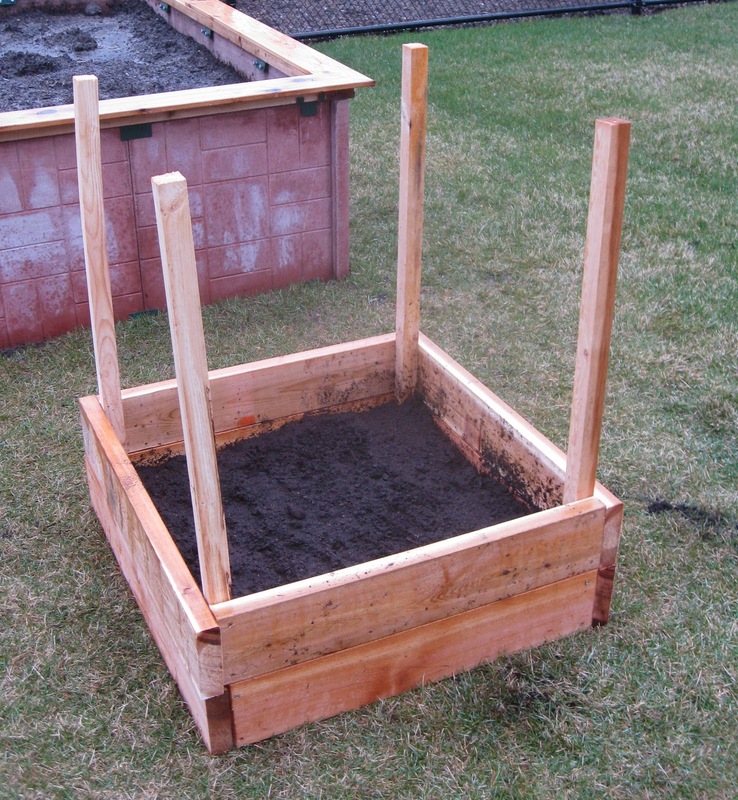 I don't think I ever showed the "finished" garden planter, and in truth it needs a little finishing, but I'm going to photo bomb for a moment, and then get back to silly stories. Apple starting to bud, I sure hope it has enough bandwidth to get the nutrients it needs from the app store. So back to hardware store anxiety. SO the lumber that I took back and then got again with Bryan... Apparently distracted by everything... bought the wrong one again. The first time was an honest mistake of ignorance, the second time was just incompetence. Also the tap measure I bought was missing, and my mental recording of the incident left it clearly on the self checkout machine at the store. I hate those things, really honestly and truely. They put people out of a job, piss me off, they don't work and they are slow. Now is now, and I've typed much more, and for longer then I thought, bed time.